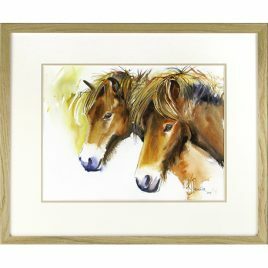 Kaye started her watercolour career following a painting course at Flatford Mill in 2001. She is now an established artist in Somerset, exhibiting in two local galleries, 303 Gallery in Martock and the Churchgate Gallery in Porlock. Achievements are winning the Chairman’s Choice award at the Bath and West Show 2009 and exhibiting in the Mall Galleries in London as part of the Art Liberating Lives Exhibition. 2010, Kaye had a solo exhibition at the A2 Gallery in Wells, 13th-27th February. The paintings included a collection of original watercolours which were auctioned via her website in support of Help for Heroes and received national interest. 2011, Watercolour “Porthpean” voted best in show, Leigh Art Exhibition. Alongside, 3 solo exhibitions and 2 mixed gallery exhibitions, Kaye has organised numerous workshops and has also written and illustrated a children’s book “Kiss it Better”, published 2011.